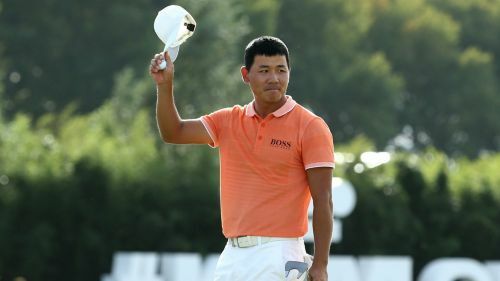 Wu Ashun came out on top in a last-day tussle with Chris Wood to win the KLM Open by one shot and claim his first European Tour victory since 2016. The 33-year-old birdied three of the final five holes at The Dutch and was confirmed as the tournament's winner when overnight leader Wood three-putted at the last. Rounds of 64 and 66 had put Wu in control over the first two days and though a 71 on Saturday handed Wood the initiative, the Chinese's score of 16 under for the tournament proved to be enough. When Wu recorded his fifth birdie of the day to move ahead of Wood, the Englishman was well placed in the middle of the fairway on the last. Yet he left his approach way short and then fired his first putt off the back of the green, leaving him with too much to do to get up and down and force a play-off. It meant Wood had to settle for a second-placed finish, his third on the European Tour this season. Wu had been on the putting green preparing for a potential play-off when he was notified of Wood's par and his resultant victory. "I want to thank my caddie, he told me just to focus every shot," Wu told Sky Sports. "I was focused every shot to do my best, that was the goal today." Thomas Detry and Hideto Tanihara finished two shots back at 14 under while Padraig Harrington ended his tournament three adrift of Wu after a closing 68.